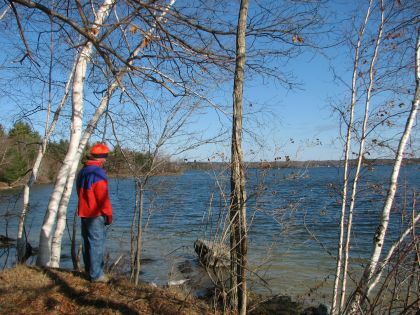 The Vassalboro Wildlife Habitat is privately owned with public access. The owner should be notified immediately if you notice a hazardous condition or have a specific concern. The Members of the Vassalboro Trails Committee, Vassalboro Conservation Committee and the Town of Vassalboro shall not be responsible or liable for your use of these properties. 220 acres (Nature trail is off Webber Pond Road - 0.7 miles south of Natanis Golf Course Clubhouse on left) This beautiful mixed woodlands and wetlands contains 2,200 feet of undeveloped shoreline on Webber Pond. The area is home to beaver, deer, small mammals, hawks and other birds. It is managed by the Kennebec Land Trust. Protecting this acreage will help guard Webber Pond water quality for future generations. Motor vehicles are prohibited. The existing trail for snowmobiles is exempt. Hunting is by permission in specified areas only.